When a sudden toothache, broken tooth, or trauma to the mouth occurs, it quickly causes your day to become challenging and painful. You do not have time to deal with a dental emergency. As a result, you may be tempted to delay going to your Oklahoma City emergency dentist or you may even try to treat the problem at home. However, the longer you wait to schedule an appointment, the more likely Dr. Joe Isaacson will not be able to save your tooth from needing to be removed. As an emergency dentist, he is helping to save the world one tooth at a time with same-day care. Dental emergencies are not widely discussed. As a result, many people do not know which issues require immediate care. This often causes treatment to be delayed, leading to irreversible damage. We do not want to see this happen to you. Although you can never fully prepare to be in this situation, one in six Americans have an unexpected dental complication this year. Therefore, it is important to learn which problems require immediate care and how to respond to help promote the successful rehabilitation your tooth. Dental emergencies can take many forms, with each requiring a specific approach to save your tooth. 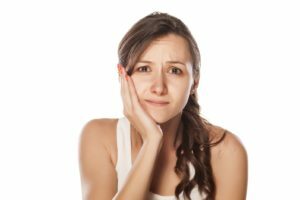 When the unexpected happens, the first thing you need to do is call your emergency dentist in OKC and then react appropriately. Knocked Out Tooth: Hold the tooth by the crown and rinse it with water. Do not use any soaps or cleaners and do not scrub or dry it. Try to reinsert it back into the socket. If you are not successful, it needs to stay moist so place it in a cup of milk or water. Dislodged Tooth: Gently try to reposition it back into place and bite on a piece of gauze to prevent it from moving. Broken Tooth: Rinse your mouth with water and avoid placing pressure or chewing on the tooth. Keep it clean until your appointment. If you have discomfort, use over-the-counter pain relievers and apply a cold compress to the outside of the mouth. Sudden Toothache: A sudden unexplained toothache is often a sign of an infection. To stop it from spreading into surrounding tissue, you need to see the dentist right away. Use home remedies, like ice packs, to help manage any pain. Lost Restoration: If a crown or filling comes loose, do not try to fix it yourself. Keep the tooth clean and avoid eating on it until after Dr. Isaacson has repaired the restoration. Broken Dentures: Do not continue to use broken dentures or other oral appliances to prevent causing injuries to your gums and teeth. Call our office right away to have them repaired. If you find yourself facing a dental emergency, we offer same-day appointments. Do not wait. Contact Joe Isaacson Dental today for same-day care.